News, photos, videos and more about football hooliganism in England. 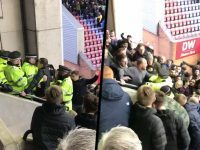 Bolton Wanderers fans clashed with cops at the DW Stadium during Saturday afternoon's Championship match against Wigan. 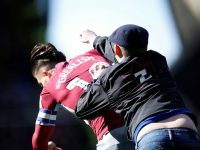 Aston Villa midfielder Jack Grealish was attacked by a Birmingham City fan during this afternoon's Championship match at St Andrew's. 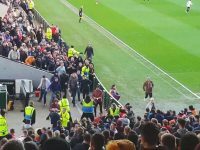 A brief fight broke out between Bristol City and Swansea City fans during their Championship clash at Ashton Gate on Saturday. Millwall and Everton fans clashed in a mass brawl outside The Den ahead of their FA Cup tie on Saturday. Fan trouble broke out at the DW Stadium after Wigan Athletic's 1-0 win over Manchester City in the FA Cup on Monday evening. Tottenham and Arsenal fans clashed ahead of the north London derby. A Southend United fan attacked rival Colchester supporters during Saturday’s Essex derby at Roots Hall. Trouble between Plymouth Argyle and Millwall fans. A Forest fan attacked a Derby County player at the end of the East Midlands derby.